Lloyd Godson began his two week underwater habitation experiment just hours ago in Australia. Here is an AP story that sums it up. Lloyd - if you're reading this down under-down under - we wish you well and stay safe! Quantum Limit will cover this story as we are able and perhaps arrange an interview with Lloyd during his next very busy 14 days. A MARINE biologist will spend the next two weeks in an airtight box at the bottom of a lake in an experiment to measure the physical effects of being underwater. Lloyd Godson, 29, today began his unusual holiday in a steel box at the bottom of the lake near Albury, his home town on the NSW-Victoria border. Measuring just nine cubic metres, the box is where Mr Godson will eat, sleep and surf the net for the next fortnight, while being tested for the psychological and physical pressures of being underwater. He will have to generating his own oxygen and electricity and grow some of his own food. Funded by the Australian Geographical Society, the project is a lesson in self-sufficiency and sustainability and a long-held, if slightly unusual, dream for the scientist. 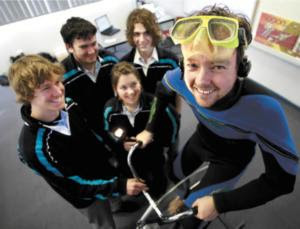 "It's something I've always been fascinated with ... in university I got more and more interested in sub-sea habitats and submersibles," Mr Godson said before jumping into his underwater lair, named the BioSUB. "Compared to out here, it'll be a refuge from the last couple of days; I want to just get in there and get on my little camping bed and take it easy for a while." But there'll be plenty to do over the next two weeks, including regular virtual classes with schoolkids around the country, daily psychological tests and basic housekeeping. The BioSUB is powered by a range of energy systems, including an electricity-generating bicycle, solar panels, and a unique contraption that creates oxygen from water using algae, called the Biocoil. Mr Godson, who brought down drums and photos as his luxury items, said his main concerns were air quality and maintaining the Biocoil, which had yet to be thoroughly tested. "The thing that differentiates this project from a lot of other underwater habitat programs is that it's not a billion or a million dollar program and it's not using conventional methods," he said. A team of divers and volunteers on land will monitor his movements and sound.